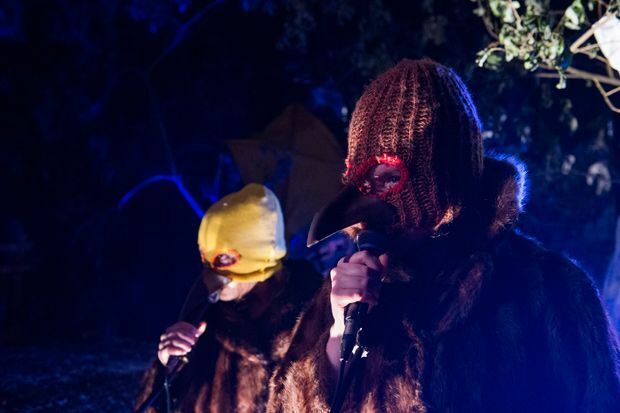 Over a career spanning two decades, Grid Iron Theatre Company have established a reputation for imaginative use of location. Although Light Boxes represents the debut full-length production from director/adapter Finn den Hertog of Shane Jones’ novel, this mesmeric show demonstrates Grid Iron’s pedigree. Beginning with innocent dreams of flight, beaming balloon-maker Thaddeus (Keith Macpherson) and his wife Selah (Melody Grove) take gleeful pleasure delighting their young daughter Bianca (Vicki Manderson) with kites, balloons, and dreams of soaring. It is not long, however, until these dreams themselves are grounded, as the townsfolk find themselves suddenly besieged, subdued, and hunted by the very nature that surrounds them. Faced with the looming menace of a perpetual February, the vivid paintings of kites on Bianca’s forearms are left as the sole reminder of flight in the face of long, harsh and unrelenting winter. There is a purity to the storytelling and stagecraft, as Karen Tennent’s dazzling scenography presents a setting that tells a thousand stories. As we enter an alley staging lined with woodchips, the scent of mint hangs heavy in the air, while familiar objects catch the light amid a pile of broken and splintering wood. We take our seats upon white wooden benches and chairs with branch-covered walls to our back and cloud-like formations of glinting silver balloons above our heads, while in front a single yellow kite hangs, grounded, crippled, seemingly never to fly again. The ensemble shift nimbly between parts with skill, with a punky amateurish group of bird mask-clad balloon enthusiasts turned revolutionaries (‘The Solution’) and Calder Clements, a seven-foot-tall wolf with a California drawl, providing memorably bizarre realisations of the fairytale world. Undoubtedly, however, the performances are at their finest when at their most understated, with Selah and Thaddeus sharing some particularly moving moments, with the assistance of Michael John McCarthy’s haunting score. Occasionally baffling, the mythic scope of Jones’ world means that at times events appear to outstrip the characters, leaving us reeling briefly, until the wood chips settle long enough for one of many moments of beauty and tenderness to emerge. Summerhall, 560 1581, until 30 Aug (not 25), 7.15pm. £17 (£15).